If you were hurt in a Liberty City accident, you really need to call the Liberty City personal injury lawyers at the Wolfson Law Firm. Our Miami injury attorneys have served the folks of Liberty City and Miami since 1963. We have helped families recover after car accidents; slip and falls; trip and falls; and wrongful death claims. We can help you too – just call us at (305) 285-1115 to find out how we can help. We also help our clients to be informed since we believe that knowledge is power. Our Liberty City personal injury lawyers in Miami strive to empower our clients with the necessary knowledge. We have found that the more our clients know the more they understand. As a result, the partnership of our injured clients and Miami injury lawyers grows and strengthens over time. Together we work towards reaching a fair, full and complete resolution of your case through settlement negotiations, mediation or jury verdict. No matter what – our Liberty City personal injury lawyers will stand by your side. Developed during the Great Depression, Liberty City was once the sparsely populated outskirts of northern Miami. 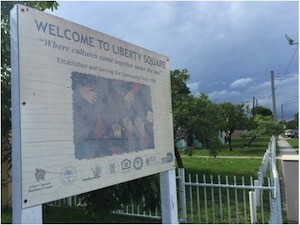 Authorized by President Franklin D. Roosevelt, the Liberty Square housing project was the first of its kind in the Southern United States. Built in 1933 as a response to the deteriorating housing conditions in covenant-restricted slums of Overtown. Into the 40’s and the 50’s Liberty City and adjacent Brownsville thrived as middle income Black American communities. Liberty City hosted churches, hospitals, and community centers, as well as serving as residences to prominent figures such as Kelsey Pharr, M. Athalie Range, and Muhammad Ali. Unfortunately segregation laws prohibited African Americans from resting or residing in popular Miami Beach. Therefore establishments like the Hampton House Motel and Villas catered to and entertained the likes of Rev. Dr. Martin Luther King Jr., Althea Gibson and even NY Yankee great Mickey Mantle visited. Our Liberty City personal injury lawyers in Miami represent folks who were hurt in all kinds of negligence cases. If you were hurt in Liberty City because of the negligence or intentional deeds of another, you should absolutely call a Miami personal injury lawyer to protect your rights. There is no need to be a silent victim. At the very least, you should get the information you will need to figure out if there is an identifiable person or company who may be responsible for your rehabilitation bills, medical expenses, loss of earnings, pain and suffering, harms and other losses. You owe that to yourself and your loved ones. If you have lost a loved one killed tragically and suddenly in an accident, the Liberty City Miami wrongful death attorneys at the Wolfson Law Firm can help you. Our Liberty City Miami injury lawyers can represent you if you were injured because of the negligent actions of a potential defendant. You will not owe us any fees unless we make a financial recovery for you. Just call us at (305) 285-1115 for your free and no obligation consultation. Even if you don’t call us – make sure you get the answers that you need and the justice that you deserve.